March 21 marks the International Day for the Elimination of Racial Discrimination which is observed globally to remember 1960 Sharpeville Massacre when 69 black South African citizens - including ten children - were shot to death by their own police for protesting against racial apartheid laws. In Aotearoa New Zealand, events in Multicultural March, which are held around Race Relations Day, provide the opportunity for all peoples to come together, learn from each other, share, celebrate and enjoy the richness of shared cultural experiences, Mr Narayanan says. “Being together, talking and walking together, provides each of us with an individual strength. A strength to be comfortable in who we are and who we want to be, in the communities in which we live and achieve a sense of belonging,” Mr Narayanan says. “Cultural connectedness creates stronger and safer communities, for all of us. “This year, I encourage everyone to take a moment, and learn more about the people in your community, the many cultures that contribute to making Aotearoa New Zealand so diverse and have a go at learning a few new kupu (words), from a new reo (language) and cultural songs,” Mr Narayanan says. Chief Human Rights Commissioner Paul Hunt says that the Race Relations Day festivities are now more relevant than ever. “New Zealand is now one of the most ethnically diverse countries in the world. Race Relations Day enables all New Zealanders to celebrate and share their own culture, while also enjoying the culture of others,” Mr Hunt says. To celebrate and support the sharing of language, culture practise, ideas and food, a number of events have been organised around the country. 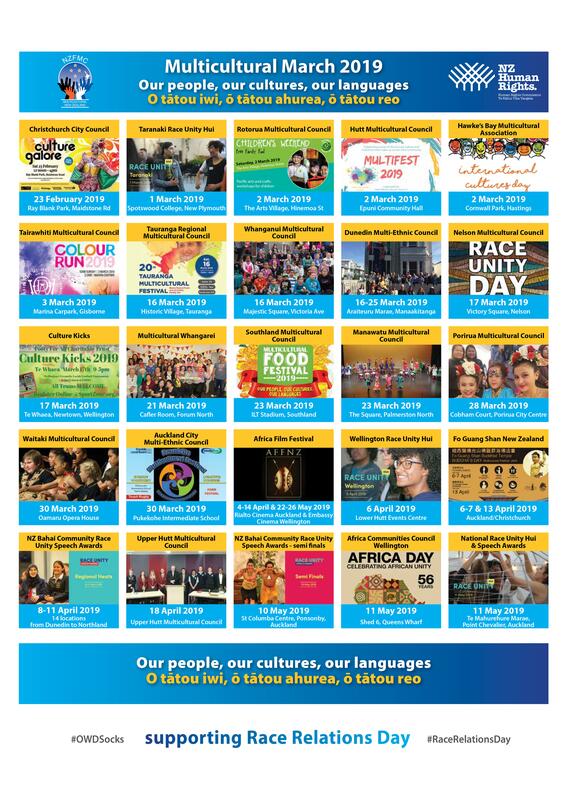 • The Hutt Multicultural Council’s Multifest 2019 on 2 March - a celebration of cultural diversity in the Valley with performances from local talent across the Wellington Region, cultural activities and food stalls. • Tauranga's Multicultural Festival on 16 March. • The Waitaki Multicultural Council’s Race Relations Concert on March 30. A poster featuring the regional events celebrating Race Relations Day throughout March, April and May can be found here. Please click over it to have more information about the events. Original generation time 1.5188 seconds. Cache Loaded in: 0.0398 seconds.